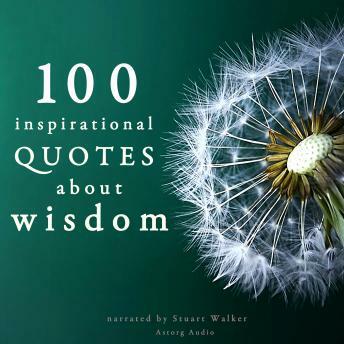 We have selected for you 100 great quotes about wisdom. We all know what wisdom is : the ability to think and act using knowledge, experience, understanding, common sense, and insight. Wisdom has been regarded as one of four cardinal virtues; and as a virtue, it is a habit or disposition to perform the action with the highest degree of adequacy under any given circumstance. This implies a possession of knowledge or the seeking thereof to apply it to the given circumstance. This involves an understanding of people, objects, events, situations, and the willingness as well as the ability to apply perception, judgement, and action in keeping with the understanding of what is the optimal course of action. It often requires control of one's emotional reactions (the "passions") so that the universal principle of reason prevails to determine one's action. In short, wisdom is a disposition to find the truth coupled with an optimum judgement as to what actions should be taken. Those quotes will help you to think, to act, to meditate to achieve a kind of wisdom. A great quote is very similar to a great thinking and a small poem. It can encapsulate a large web of ideas, thoughts, reflections, emotions in a few words. The reader of a great quote is forced to think about what he just heard. He has to think about those words and what they mean. An excellent quote requires the reader to pause to contemplate the real meaning and poetry of a few words. A great thought reaches a level of universality. Quotes hit hard into the essence of being human. The right quote can help us to see some invisible meanings of things or subjects. The range of authors of those 100 quotes about wisdom is very wide: from Mark Twain to Winston Churchill, from Leonardo da Vinci to Albert Einstein, Sun Tzu, Mahatma Gandhi, from Dalai Lama to Henry Ford. Take advantage of the knowledge and the intelligence of all those wise men !